A severe weather warning has been issued as up to 10cm of snow is expected in parts of the UK. The Met Office’s amber weather warning, which mainly covers parts of the South West and South Wales, runs until 9pm on Thursday. Snow depths of 5cm were recorded by the Met Office by 6:30pm in Bodmin, Cornwall and Sennybridge, Powys and the weather was moving across southern England and Wales, affecting counties including Wilsthere, Hampshire, Sussex and Kent. Road users and air passengers have already been delayed by the weather and there are warnings of rail delays and cancellations, power outages and the cutting off of rural communities. Cornwall Airport, near Newquay, was temporarily closed due to snow on Thursday afternoon. An “intensive effort” is underway to help the motorists according to Chief Inspector Adrian Leisk, head of roads policing across Devon, Cornwall and Dorset. A plough and a gritter have been sent to help the drivers who are backed up along the snow-coated carriageway, according to images on social media. 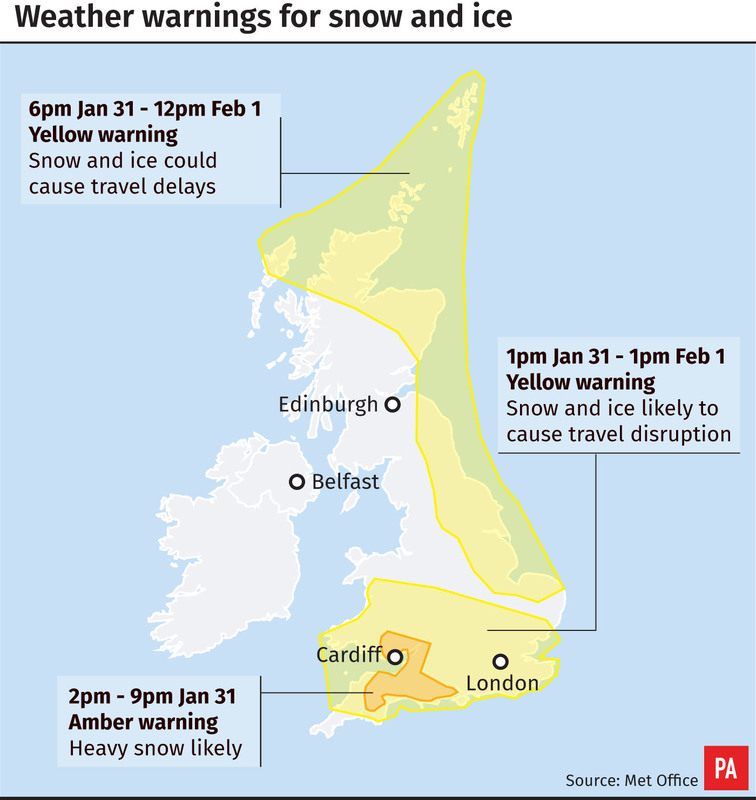 Chief meteorologist Dan Suri said: “As well as the amber warning, there are still yellow snow and ice warnings in place for a wider area across southern England and Wales and for the east of the UK and northern Scotland. “This snow and ice could be disruptive causing delays to travel. The weather warning was issued after the country had its coldest night of the winter so far. The coldest place overnight was Braemar in Aberdeenshire where the mercury dropped to minus 12.9C (8.78F) and temperatures continued to fall into Thursday morning, with a low of minus 14.4C (6.08F), according to the Met Office. The lowest ever temperature in the UK in January was also recorded in Braemar when temperatures plummeted to minus 27.2C (-16.96F) in 1982. On Wednesday night, all four parts of the UK set new records for the 2018/2019 winter with Sennybridge, Powys, dropping to minus 9.3C (15.3F), Katesbridge in Northern Ireland falling to minus 8.2C (17.2F) and Redesdale Camp, Northumberland, recording temperatures of minus 10.5C (13.1FF). Areas which will be most affected by the warning in England are Hampshire, Bath, Bournemouth, Bristol, Devon, Dorset, Gloucestershire, Somerset and Wiltshire. In Wales, the warning is for Blanenau Gwent, Bridgend, Caerphilly, Cardiff, Merthyr Tydfil, Monmouthshire, Neath Port Talbot, Newport, Powys, Rhondda Cynon Taf, Torfaen and the Vale of Glamorgan. Gritters have been out on the roads, with snowploughs, vehicles and more than 60 staff on standby in Somerset, where the country council has urged people to look after vulnerable friends, family and neighbours. Highways England, which urged motorists to “take care when driving”, said key routes affected include the A30, the A38 and the M5. Wiltshire Police said the Met Office had “told us to expect rain turning to snow, especially on hills, turning into icy conditions”. The force added: “We know from last year how disruptive snow fall and icy conditions can be, especially on our road networks. “Saturday night into Sunday could also be very cold,” Mr Wilson said.